Three years ago, famed and controversial historian Jack Granatstein claimed that Canada botched the Great War centenary. Although numerous commemorative events were planned, institutions like Heritage Canada had fewer funds to organize them. Granatstein argued that to properly commemorate the war, the Canadian government needed to invest in “TV documentaries on the war and its battles and on the events, positive and negative of the home front. We need books, conferences, lectures and displays in our national and local museums. We need to remember.” Remember who, though? Since the social turn of 1970s, the figure of the officer and gentleman has ceased to be the central subject of historical interest. Yet, the diverse roles of women in war still remains neglected. While Granatstein’s pronouncement acknowledges women’s involvement during the war, he references only their munitions factory work and the fact that some women (those related to soldiers) received the vote in 1917. The female veteran of the Great War is seldom seen, even though over 3,000 Canadian women can claim this distinction. Studying these women and their lives as veterans can offer much needed insight into the ways that gender impacted veteran pension policy within a predominately male armed forces. Between 1914 and 1919, thousands of Canadian women enlisted in the Canadian Army Medical Corps (CAMC) as Nursing Sisters. Most served overseas in active theatres of war, including some assigned to remote fronts in Russia. The Canadian Nursing Sisters were unique among nurses in that they were classified as officers, a rank not afforded to nurses in the military organization of other countries until the 1940s. Their commissioned status meant Canadian Nursing Sisters received pay equal to their male counterparts and the respectability due to their rank. Notably, as Nursing Sisters they were enlisted members of the armed forces – a distinction which marks them as some of Canada’s earliest female veterans. It also meant that they were eligible to receive pensions. Officially, the gender of these pensioners played less of an influential role in the administration of pensions to female veterans than one might expect. The Board of Pension Commissioners (BPC)––which eventually evolved into the Canadian Pension Commission––actively considered Nursing Sisters as veterans. The language used by the Board to define female veterans was similar to that used for men, which illustrated that a female veteran’s service was equally valued––at least, according to the state––as their male counterparts. Simply put, for the first time, some women received pensions for their own military service rather than that of a male relative, which should not be considered insignificant. Notably, female veterans were also considered breadwinners by their families and, at times, the state. In a scenario where a Nursing Sister died during or shortly after the war, her parents became eligible for a dependent pension if they could prove their daughter had been financially supporting them during the war. Following Mary McKenzie’s death during the war, her parents applied for a pension. Her mother had been a housewife and her aged father worked only part-time. Although her parents were initially denied on the grounds that her father did have an income, they eventually received a $40 monthly pension. In this case, it is clear that both McKenzie’s family and the BPC considered her as the primary breadwinner for the family, which is reflected in the acceptance of her application. Parents were not the only ones to rely financially on female veterans. Widowed husbands of these nurses could also apply for pensions because of their wives’ service. At the age of 36, veteran and mother of two, Daisy Black, committed suicide by drowning. Like many veterans, her war service had left her both mentally and physically exhausted. Following her suicide in 1930, her husband wrote to the BPC, asking for a loan. The death of his wife, Daisy, had necessitated moving to a new home, hiring a housekeeper for the children, and covering funeral expenses. His application was denied, not, as one might expect, on the basis of his wife’s suicide, but because the Board considered the funds in Black’s bank account sufficient to cover such expenses. Approximately half of the Nursing Sisters in a random sample of 36 who applied were denied pensions. Marjorie Aitkens, for example, was denied a pension as she was unable to prove a substantive link between dysentery, which she claimed she had contracted while serving in France, and her war service. For those women, like Aitkens, who were denied a pension, they were unable to prove that “a decrease of ability to earn a livelihood in the general labour market” was attributable to some injury incurred while serving. Although some nurses worked close to the front line, most were unlikely to experience direct enemy fire. Consequently, the majority of their war-related injuries were the result of an illness or fall––the causality of which is more difficult to prove than a bullet wound or amputation. Yet, this was not uniquely a female problem. Both male and female veterans found it difficult to receive pensions for illness rather than physical disability. Those who lacked sufficient medical paperwork from the war or developed symptoms later in life were rarely awarded pensions for illness. The criteria for pensions, then, remained similar across gender lines. A Nursing Sister among her male comrades in February 1918. 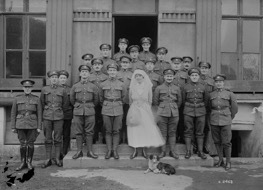 She, along with the other men in this photograph, had just received the Mons Star for service in the early years of the war. Library and Archives Canada, MIKAN No. 3404882. As we are now in the fourth year of Canada’s Great War commemorations, we must better acknowledge the roles of Nursing Sisters as veterans of the First World War. For thousands of women, the Great War marked a momentous event in their lives. They left their homes, travelled to foreign places, and played a crucial role in Canada’s war machine. 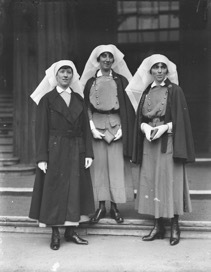 Following the conflict and their subsequent return home, nurses were actively involved in altering, to a small degree, notions of women’s place in the military. Certainly, as Granatstein wrote, “we need to remember,” but we also need to ensure that we remember the diversity of veteran experiences following the Great War. Eliza Richardson is a PhD student at Wilfrid Laurier University and the Archives Manager of the Laurier Centre for Military Strategic and Disarmament Studies. Her current research continues to delve into the complexities of the post-war lives of the C.A.M.C Nursing Sisters. Vera Brittain, Testament of Youth (London: Victor Gollancz Limited, 1933), 42. J.L. Granatstein, “Why is Canada botching the Great War centenary?,” The Globe and Mail, April 21, 2014. Veterans Affairs Canada, “The Nursing Sisters of Canada,” accessed December 3, 2016, http://www.veterans.gc.ca/eng/remembrance/those-who-served/women-and-war/nursing-sisters. Cynthia Tomen, Sister Soldiers of the Great War: The Nurses of the Canadian Army Medical Corps. (Vancouver: UBC Press, 2016), 15. Mary McKenzie, 82208, Reel 244, Veterans Affairs Canada Pension Files, Laurier Centre for Military Strategic and Disarmament Studies Archives. From here on, cited VAC Pension Files, LCMSDS Archives. Daisy Black, 168641, Reel 224, VAC Pension Files, LCMSDS Archives. Marjorie Aitkens, No Number, Reel 211, VAC Pension Files, LCMSDS Archives. In her recent article “Canadian Military Nurse Deaths in the First World War”, Dianna Dodd has argued that medical officials often attributed Nursing Sisters’ illnesses to an inability of coping with the stresses of wartime work. This gendered construction of illness is not present in the pension files. Rather, pension board officials kept to a strict code of “attributability.” If pensioners, regardless of race or gender, were able to prove, with medical documents and affidavits from acquaintances, that their injuries or illnesses were attributable to wartime service, they were awarded a pension. See introductory post for further details on the Board of Pension Commissioners’ principle of attributability. Why do I feel as if I’m being assailed in the first para? I said nothing about gender in the quoted sentence or two, nothing at all. And certainly I’m in support of woman Great War vets getting all the attention male vets get. An interesting article here, and now I feel better. a good article. I wonder if matters other than pension are being actively researched. eg war service impact on marital status, post war employment fields and whether their status as unique individuals declined in society as the years progressed.